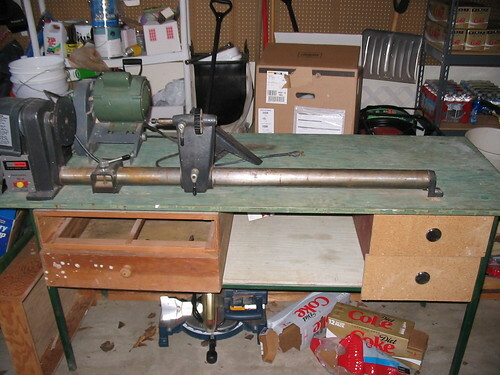 I am now the proud owner of a lathe. Can not wait to be able to post some kind of project that I make on it. BUT, first I have some other fun to deal with, the lathe is a 1970’s 12” Craftsman that i purchased off of someone on Craigslist. I tested it all out and it worked fine, however it was mounted to a very heavy table and since I have a basement shop I decided to remove it from the table before trying to get it down stairs. For beeing mounted to the same piece for 30+ years it was a quick removal, now the trick is to get the table (which is still pretty heavy) downstairs and remount the lathe on to it and get it all working just as nicely again. I am thinking also of sprucing up the table a bit and doing some work on it. So more blogs are to come on this subject. In the meantime here is my prize as it looked before taking it off the table. I am sure I will have multiple questions as I head down this new woodworking path so thank you in advance for the answers that I know I can count on getting. It is always exciting whenever we get a new tool into the shop. It really gets the woodworking adrenaline pumping. Congratulations on the find. Now you need to order some pizza and recruit some help with the table and you will be in business. Great find…I’m sure you enjoy it. Its been a long time since I have turned anything. PM me if you still need a hand. Looks like an interesting find. Good luck with it. Looking forward to seeing some turnings. Happy to know that u are now a owner of a very important wood working tool which will keep u busy for quite some time. I am waiting for your experience and projects on wood turning so that I can add one more dimention to my hobby. Recently I made a 1”x 20” dowel from a straight branch of a tree from my backyard after thoroughly drying it in the Sun for many months. Since I have no lathe I did it with the help of small plane and it has come out fairly good. I will post a picture of it. If I can learn turningI can do many things. So please feed me your experience on the lathe. Good luck. Congrats on the purchase. 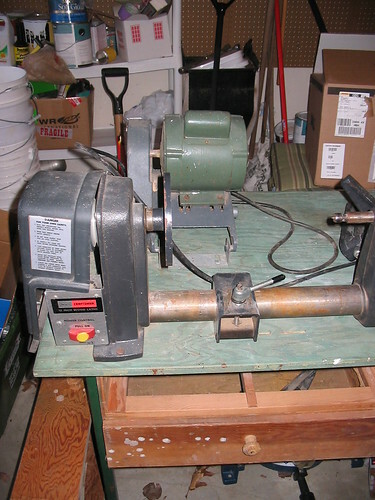 Your Lathe looks very similar to my when I first ‘rescused’ it from a freinds shed. Lots of TLC and it runs very well. Still need to learn how to use it :) but exciting times ahead.